This week Maxwell spent some time with my parents. He loves my parents dearly and is always excited to see them. Since they have moved Maxwell rarely gets to spend time with them, however they looked after him one night this week whilst me and Ben went out for dinner and was treated to lots of goodies! They spoil him lots, which Maxwell loves. Maxwell has recently been eating more independently. He doesn't like me feeding him with a spoon and enjoys eating finger food. His favorite meal is now fish fingers however I have been trying to introduce new foods to him most days. Maxwell also keeps hiding his food under his legs when he eats. He finds it funny but it gets very messy at times. A few weeks ago I wrote that Maxwell was getting more confident with wearing his new shoes. This week he has gone a step further and is now walking from the house, to the car whilst holding mine or Ben's hand. Soon he will be running down the road. Maxwell has never been introduced to many animals. He has a rabbit which he shares with A.Rachel which he loves however this week he has made a new friend. Maxwell's new friend is called Bryn and he is a Scottish dog. Maxwell met him when we visited my Nan and Maxwell loved chasing round after him and trying to pat him. Maxwell has turned into a domestic god. He has always been very helpful. He tidy's his toys away into his toy box when he is asked and at dinner time, if he spills food onto the tray off his plate he always tidy's this up however this week Maxwell has gone a whole lot further. Maxwell has learnt how to put the dirty clothes from the washing bin into the washing machine... he even manages to put the correct colours in so they do not mix! He is a very clever boy. 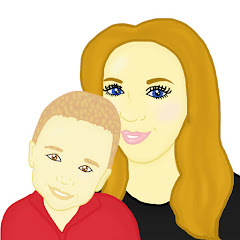 hi just found ur blog on facebook mummy blogger comps - little max is a cutie.